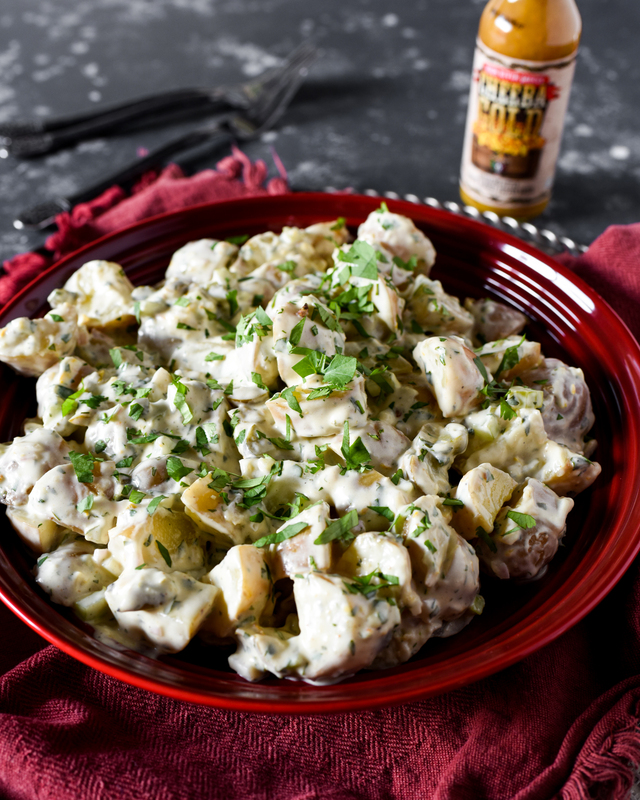 Spicy Cheeba Gold Potato Salad - Perfect For Your Outdoor Gatherings! Question: Do you have a refrigerator shelf dedicated to your collection of hot sauces? If you answered yes, then this recipe is totally for you! 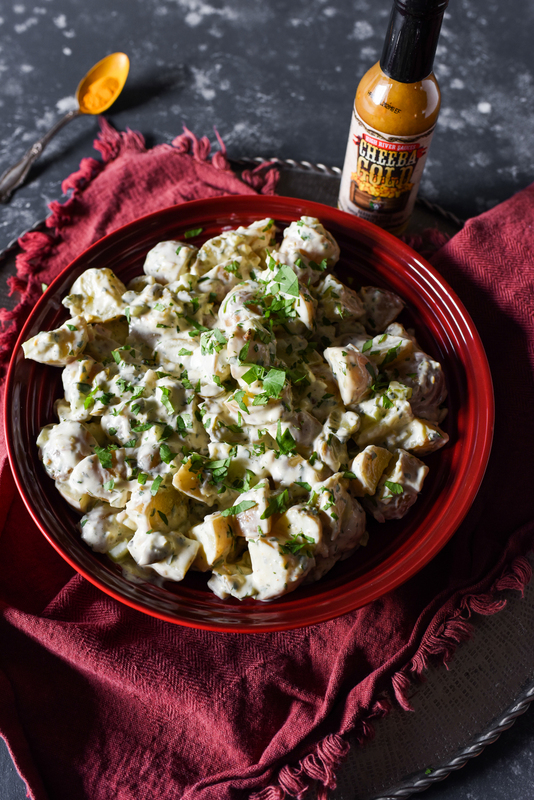 I love that the Cheeba Gold Potato Salad amplifies the characteristics of this delectable hot sauce without blowing your brains out. Every year, I make it a point to attend the CA Hot Sauce Expo, because the first year I went, it was as if I had walked into a dream-world of spicy foods! Not only were there hot sauces, there were spicy pickled cucumbers, green beans, asparagus, and all kinds of other spicy morsels. Think of it as a farmer’s market of all things spicy and hot! Plus, the people were all so friendly! But when you enter this crazy, lovely, and totally METAL hot sauce world, one thing you’ll realize is that your definition of spicy will change. I have always touted myself as a lover of spice, and I still am, but I’m much more careful these days when I tell people that I can handle whatever you can throw at me. After going to the Hot Sauce Expo, you’ll be exposed to the spiciest sauces on Earth. I can say this with 100% confidence, because some of the vendors that show up there make their sauces with the hottest chile on Earth at the moment – The Carolina Reaper. There’s absolutely no sugar coating it, I can’t handle the hot sauces of that caliber. At the same time, I don’t want to miss out on the awesome flavors of these sauces, so I’ll use them in recipes where I can “dilute” them a little bit. I get the hotness, though not that insane – hiccup inducing – mouth-on-fire type of hot, and can enjoy the actual flavors of the sauce too. 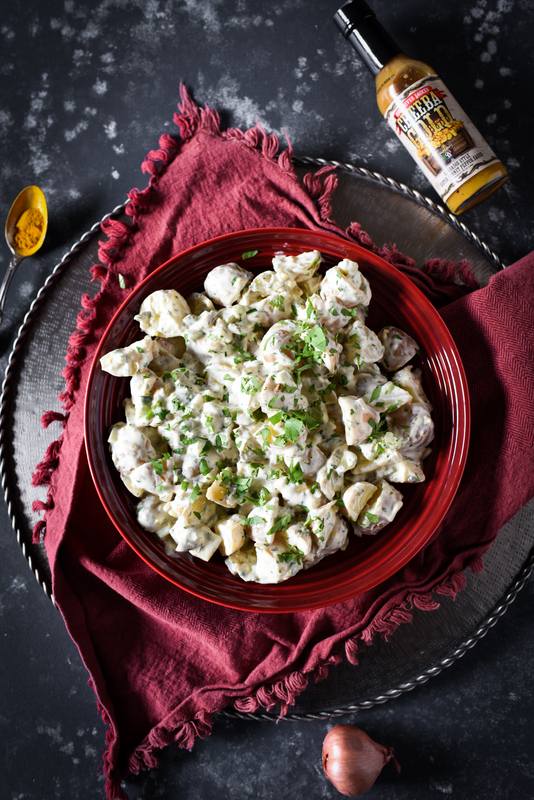 While I really do love the Barbados inspired Cheeba Gold on its own (and can handle it 100%), this potato salad really lets it shine with its unique combination of curry spices and fruit. 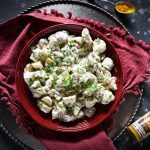 Besides tasting awesome as heck, this potato salad is actually vegan too, so you won’t have to worry about keeping it so cold for your guests because of the mayonnaise or addition of egg. Because it’s legitimately unique, your guests will gobble it up, and you’ll have wished you’d have made a second batch. You can find Cheeba Gold on Amazon, or at your local hot sauce expo. 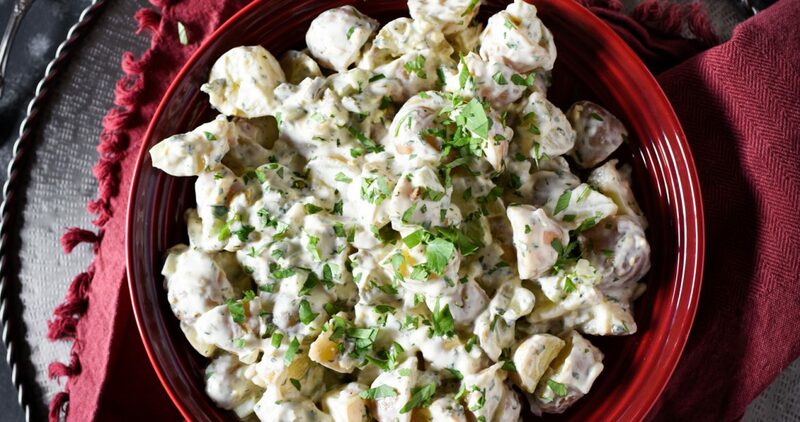 A creamy, spicy, and elevated potato salad dish that your guests will love! Fill a large pot halfway with cold water, and add potatoes. Cover and place on the stove, turning the heat up to high. Bring to a boil, and boil until the potatoes are fork tender, about 15 minutes. Drain the potatoes, place in a large bowl, and allow to cool for about 5 minutes. Add in the remaining ingredients, and mix thoroughly. Cover with plastic wrap, and place in the refrigerator for at least two hours before serving. *Disclaimer: This post contains affiliate links. I was supplied with Melissa’s Produce Baby Dutch Yellow Potatoes, but was not compensated in any other way. I just love High River Sauces and Melissa’s Produce! Love your video and that potato salad rocks as well. Thank you so much Cathy!! It’s definitely got a kick!